We work with Microsoft's Office suite to craft data management solutions. The suite includes Access database software, which is tightly integrated with the Excel spreadsheet program. Behind the scenes, Microsoft's SQL Server has the industrial-strength capability to deliver unlimited amounts of stored data through websites. A database is the digital equivalent of a row of filing cabinets. Any records that can be kept on paper, and stored in a manila folder, can be saved in a database. Customer accounts, vendor records, product details: All are common data types that can be stored, retrieved and manipulated with a well-designed Access database. A database can immediately streamline an enterprise's record-keeping, eliminating at a stroke the endless duplication of paper records. For example: A customer's contact information doesn't have to be duplicated on every order or invoice. With a relational database's dynamic linking features, every record connected to that customer will be instantly updated whenever the customer's master record is changed. As important as databases are for internal management, they are equally essential for delivering information, or selling products, on the internet. A website driven by a database avoids the problem of obsolete pages, displaying outdated information about products, that's almost unavoidable with old-fashioned, hard-coded sites. We can efficiently and economically design a database to automate your website. Proven data-delivery, search and data-entry modules can be readily adapted to your enterprise's needs. A related business tool, a spreadsheet, gives managers powerful tools for analyzing the information stored in a database, or culled from any other source. You know about spreadsheets. They're just the digital equivalent of keeping data in a ledger. But unlike paper ledgers -- which can get messy with cross-outs, erasures and liquid paper -- digital spreadsheets keep their easy-to-read format and are ready any time you need to check your numbers. The latest Excel spreadsheet software can do so much more. Here are a few examples of what you can accomplish with a custom designed Excel "workbook." A catch-all for your business data. A single spreadsheet prepared from multiple source documents, which can include other spreadsheets, images, Word documents, PDF's and internet links, can help your business corral into one place every piece of information you need to refer to. For instance, a spreadsheet linked to a database of your clients could let you pull up a report on every customer with an outstanding balance. That's done with one mouse click on a simple built-in form (the sort of thing we'll design for you.) It could also highlight the oldest accounts, or largest balances. From that form, you could easily create and print personalized collection letters (with envelopes!) Each customer's letter would automatically include the exact amount past due -- far more effective than sending a non-specific form letter, or even worse, doing nothing. 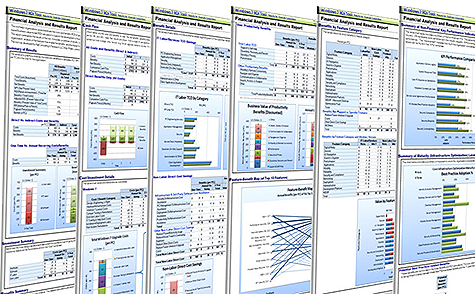 A single Excel workbook can combine and analyze data from a wide range of sources. Information stored in an Access database can be exported to a spreadsheet for analysis, creation of graphics, and many other tasks. Among Excel's most powerful features is its ability to project how well you are doing and how you'll do in the future: If you stay on your current sales and spending track; or if you shake things up a bit and try something new. You can instantly see the results of changing a single variable, or multiple variables, in your business model. This may seem too complicated for a small business. But it's not. Built-in Return on Investment (ROI) functions in Excel help you project when you'll reach your break-even point, or a profit goal, by creating alternative scenarios. That might involve an ad campaign, or a rate increase, or a change in vendors. A "watch window" in your Excel workbook lets you see each scenario's results at a glance. As well-designed spreadsheets are making your life easier, they can also help you look like a pro. One-click tools allow you to create 3D charts and info graphics, to help communicate with employees, customers, bankers -- or anybody else -- about facts, trends and projections from your business data.